Every player who laces on a pair of skates has a different entry point into the game, but for U.S. National Team Development Program defenseman Scott Savage, his might be one of the more unique. Born in California, Savage was 4 years old when he and his family moved from Lake Arrowhead south to San Clemente. The people the Savage family bought the house from were strangers at the time, but they made one suggestion that changed the family's life. "The people we purchased the house from told us to check out the roller-hockey rink," Savage said. "They just said if you're looking for something to do, check out the roller rink. I checked it out and I was hooked." The hook sunk deep -- Savage shifted from the roller rink to the ice rink at age 10 and began to develop the high-end skills that attracted USA Hockey. He had 24 points in 31 games with the L.A. Selects U-16 team in 2010-11, which earned him a spot with the U.S. National Team Development Program in Ann Arbor, Mich. In 43 games with the USNTDP U-17 team last season, the 5-foot-11, 150-pound blueliner had two goals and eight assists. "His mobility, his skating, he's improved tremendously," Don Granato, who coached Savage on the USNTDP U-17 team last season and has him on the U-18 team this season, told NHL.com. "[The strong foundation] was there, but … to play a USHL schedule was a huge jump." Granato said he believes clearing that hurdle is a mental as well as a physical challenge. "It's a mental challenge that they're not physically able to do what they used to do," he said. "They're being challenged physically and for the first time in their careers they're being mentally challenged, too, because it's, 'How do I compensate for this? I'm not the most skilled guy on the ice anymore.'" In addition to dealing with the rising level of play, Savage had to get used to being away from home for the first time. And there is a big difference between the sunshine of southern California and the harsh Michigan winters. "It was tough at first to leave home, especially from California," Savage said. "I can't go back on some of the short weekends we have off. It was hard. My dad's a fireman, he can't get off much. It's one of those things -- you have to grow up and get used to it." Savage adjusted well, and Granato said a turning point was the Under-17 World Hockey Challenge, held last December and January in Windsor, Ontario. In five games, Savage had three assists as the U.S. team won the silver medal. "With every kid here, the demand was very high, something that they could not prepare themselves for before coming in," Granato told NHL.com. "He responded very well to everything. His progress from last season to this season is immense, his improvement. I've been very impressed with his improvement overall." Scouts also have noticed. One Eastern Conference talent evaluator said of Savage: "He's raw. He's got to get more confidence at this level of play, but once he gains that confidence he'll be fine." Savage has shown that improvement early this season by putting up a goal, two assists and a plus-6 rating in four USHL preseason games, and earning an invitation to the inaugural CCM/USA Hockey All-American Prospects Game, a showcase for 40 of the best U.S.-born prospects for the 2013 NHL Draft. He had one shot on goal and a game-high three blocked shots in the contest, played at First Niagara Center in Buffalo. "I thought he went into that game and played his game," Granato said. "He wasn't in awe, he didn't look nervous. That's a testament to the experience he's gained over the last year." "I like Scott," NHL Network analyst Craig Button told NHL.com. "He's raw in terms of using his strengths and abilities to his full advantage, [but] he skates well, is a good competitor, has decent puck skills and has a good grasp of the game." Savage said playing for and developing at the NTDP training center has done wonders for his game. "It's been a great experience so far," he said. "The things we have as far as development, the things we have access to, is huge -- off and on the ice. We have a great coaching staff and all those things we have access to are great." After the season, Savage's next move will be further east -- he's committed to Boston College for the 2013-14 season. 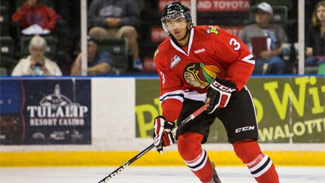 The Vancouver Giants selected him in the ninth round of the 2010 Western Hockey League draft, but Savage said his commitment to BC is strong. "I love Boston as a city, and of course the program at BC is a prestigious program," Savage said. "The academics are there. That's one of my strong values -- I want to go to a good school. I didn't think I could go wrong at BC." Between then and now, there's a lot of season left to play, and a lot of time to continue improving areas of his game that need work, notably getting stronger. "They're all evolving players," Granato said. "You've got players at the professional level that are still learning immensely and evolving. For him it's … he's just got to continue to improve."